Well folks, we finally made it! The last recipe in the Baked Occasions cookbook! 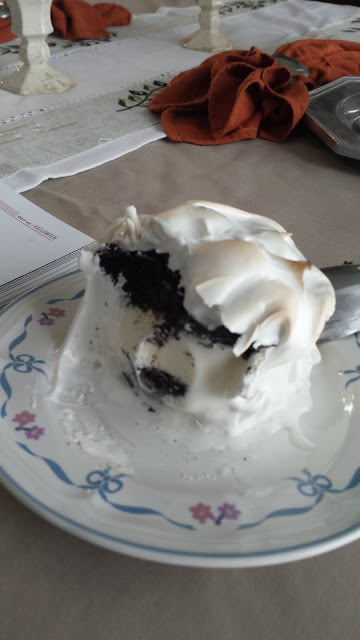 This one is from back in October but it intimidated me since it has ice cream AND it has baked meringue on the outside. Meaning they have to be eaten immediately - all 12 of them. Turns out I should not have been so intimidated. They needed a lot of prep work and need to be in the freezer with the meringue for a couple hours before baking at 500 degrees. Could easily make them, then take them out and have ready in 3 minutes for dinner guests :) We did just that! My mother in law had my parents and grandparents over to see her new place and I popped these in the oven quick. A good way to celebrate the last recipe! !